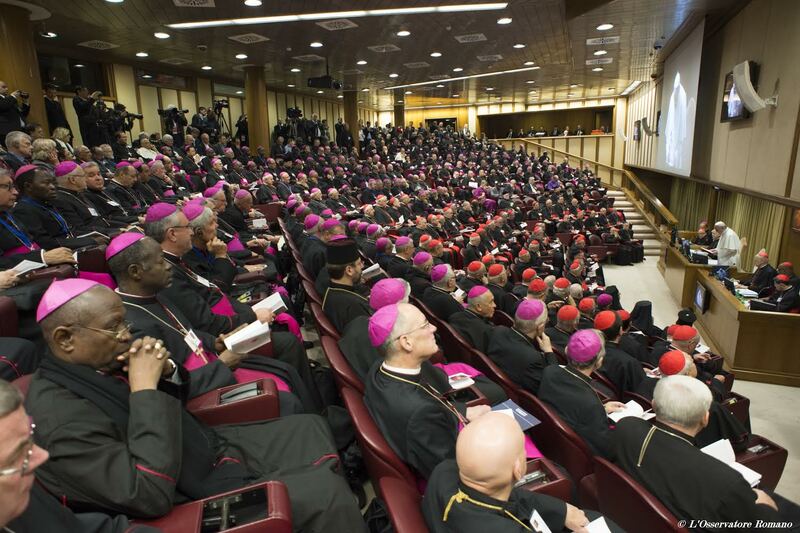 The Vatican on Wednesday published the second set of reports completed by the small circles in the Synod of Bishops. The circles are divided by language groups. The circles are working their way through the Instrumentum Laboris. There are two Spanish-language groups, and here is a ZENIT translation of the report from Group ‘B’. It was thought that the second part contains many positive elements on the discernment of the family vocation, but what is missing, first, is a lack of connection with the first part and, in the second place, many aspects are addressed without a more organic and logical connection of the issues addressed. Posed as a group reflection was to ask about the meaning of the Synodal work. The Doctrine is known but the exigencies of the reality and the new accents of the theological reflection must be taken into account, so that there really is a significant contribution. The Instrumentim Laboris is respected methodologically, but it is hoped that the final document can reorder the subjects better, as there are many repetitions in several numbers that must be looked at with greater care for a better distribution of each one of the subheadings. In the first chapter, there was a good exchange on the anthropological aspect of the family, image of the Trinity. Some of the interventions in the Hall were taken into account and assumed as ways. Emphasized in the second chapter, Family and Life of the Church, was the missionary dimension of the family. The third chapter, Family and Path to Plenitude, was the object of reflection, enriching it with ways regarding the children, noting a lack in reference to the necessary mercy with children that suffer the consequences of intra-family violence, abandonment, parents’ divorce, etc. Special attention was given to the subject of youth with its positive values and deficiencies in face of marriage. A reference was enriched and proposed with more explicit reference to the texts both of the Old and the New Testament (God’s nuptial love for His People) as well as the rich post-Conciliar teaching on the family. The members of the group thought that there are significant absences or few references in this part on subjects such as chastity and virginity, holiness and spirituality of the family. We must also assume the deficiencies of more organic and family pastoral care, pointing out the achievements and realizations as well as the absences. There is awareness of the complex and diverse reality existing in our countries, so that the illumination of this part must be ample to be able to have answers adjusted to the different scenarios. We worked intensely in a cordial and fraternal atmosphere, and 30 ways are proposed for the consideration of the Plenary [Assembly].